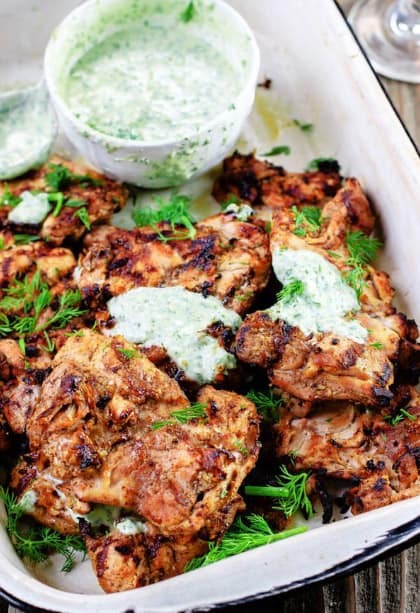 It’s difficult to believe this exotic Caribbean dish is actually just a simple chicken recipe combined with high-quality bottled French mustard, Italian parsley, splash of soy, herbs, and spices. Adding a small amount of non-fat yoghurt will bring a perfect dose of creaminess and complete this tropical heaven. Process in a blender herbs, mustard, all spice, garlic, chillies, juices and soy. Rub into chicken pieces and leave for 10 minutes or so. Mix yoghurt with ground cumin and coriander to taste and set aside. Roast chicken in a very hot oven or on a barbecue and serve with the yoghurt either sprinkled over the top or to one side.